At the 2018 Geneva International Motor Show, the tire manufacturing company Goodyear debuted a new type of tire that aims to reduce the amount of carbon dioxide in the air. The concept behind new tires, named Oxygene, is unique — it involves embedding living moss within the tires’ sidewalls. The moss-filled tires not only absorb moisture from roads while in motion, but can also pull carbon dioxide out of the air to fuel the moss’ photosynthesis. A byproduct of photosynthesis? Clean oxygen. In a city roughly the size of Paris, Goodyear estimates these tires could produce 3,000 tons of oxygen and absorb over 4,000 tons of carbon dioxide per year. Goodyear explains that it wanted to focus more on how their tires would handle material waste, emissions, and energy loss. 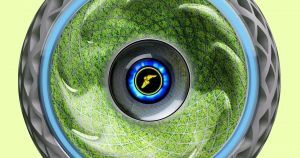 The end result is a tire with several interesting features that, if implemented on a greater scale, could significantly reduce carbon dioxide emissions. The Oxygene tires can do more than just clean the air, however. They’re also self-sufficient — the energy generated during the moss’ photosynthesis can power the tires’ electronics. This includes sensors, an artificial intelligence unit, and a light strip that changes colors in order to notify other drivers the car is braking or changing lanes. It’s arguable that Oxygene tires will be more resource intensive than typical tires, given the addition of the moss to the design. Goodyear addressed these concerns at the motor show, explaining that the tires are 3D-printed with rubber powder from recycled tires. And since they’re made to be long-lasting and puncture-free, drivers won’t have to worry about replacing them at the same rate as regular tires. Close up image of Goodyear’s Oxygene tire with blue light up strip. Image Credit: Goodyear. Since Oxygene tires are still conceptual products, there’s no telling if Goodyear intends to mass produce them, or even do a limited run. Should Oxygene make the leap from design concept to real tire, though, it could go a long way to reducing air pollution around the world — an issue that grows ever more serious with each passing year. 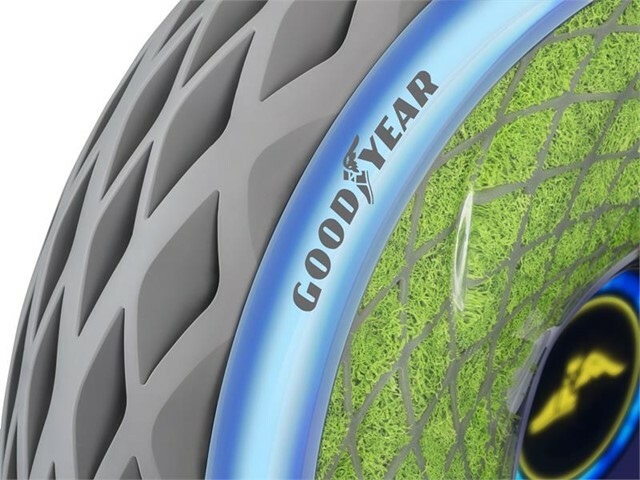 Perhaps Goodyear’s Oxygene design will inspire other companies to pursue similar products. Electric cars are expected to overtake diesel and gasoline-powered cars by 2040. Perhaps carbon dioxide-absorbing tires could similarly overtake regular tires in the next few decades as well.